The Rauzy fractal, the three shapes are similar and together they build the next size up. Having warmed up we move on to some more serious maths, of different levels. We start with an example of how knowing maths can help perpetrate reduce fraud, with an explanation of the Luhn checksum algorithm. We also have the observation from reasonable deviations that a class of 2×2 matrices are isomorphic to the complex numbers. You can learn how to bound binomial coefficients at the Endeavour, or generate Pythagorean triples at 360. To stretch your mathematical muscles a little more look for Terry Tao, considering polynomials on finite fields ranging over a finite group. Technical but interesting. If you are interested in the culture of maths, you can sample from the ancient to the modern. The mathfactor podcast discusses the Ishango Bone, our earliest record of mathematical thinking from 20,000 years ago, and Curving Normality considers how immigrant children fare in the maths education system. That’s the hard work out of the way, so its time for some mathfun. Returning to 360, you can consider a geometric excuse for an addictive game. Gil Kalai presents a couple of very high quality puzzles, with an elegant solution that is easy to explain, but hard to find. Another interesting puzzle from Jason Dyer, can be turned into a magic trick, or maybe that should be turned back into a magic trick. Less thought is required to enjoy Mike Hubin’s Tolkien spoof. If this list has not given you enough of that math fun, and you want links outside the blogging world Larry Ferlazzo has lists of maths websites and glossaries. To conclude as I began with numbers meaning something other than mathematics, A million good things has a very ambitious project of posting 1,000,000 good things, one every half hour for most of the rest of his life. He is starting next year and so far only has 30, (15 hours worth) worth lined up. Lets make sure the list contains lots of good maths! You seem to have missed the link for Möbius strip sesquicentennial. Could you give more detail on the Rauzy Fractal, and just how 44 is linked to it? 44 is a Tribonacci number (as defined), and the Rauzy fractal is linked to these. I will probably do a longer post on Rauzy fractals at some point. However for the moment note that the three shapes are all similar and together they make a larger copy of the same shape. 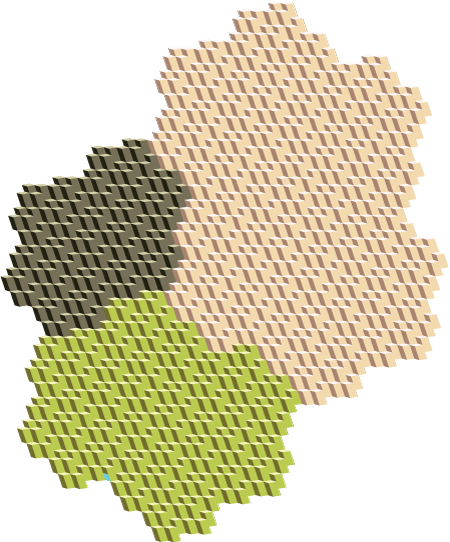 Thus the area of the new tile is equal to the sum of the three tiles shown. In addition the same scaling takes the smallest tile to the medium and the medium to the larger of the three. The three tiles together plus a new large and a`new medium gives the next tile up and so on. If I instead started with two square tiles I would get tiles whose areas were the Tribonacci numbers. The Rauzy fractal has the benefit that it respects shape in the scaling as well as area. I think you mis-coded the link for the 360 blog. There seems to be an extra http-colon-slash-slash in your link. When I removed it, the link worked fine. I wish I knew more about number theory….